Regency, Federal, Early Republic: we use these terms to cover (roughly) the period from 1790-1820, though technically the Regency period would mean only 1811-1820, when George IV served as Prince Regent, ruling for his incapacitated father, George III. 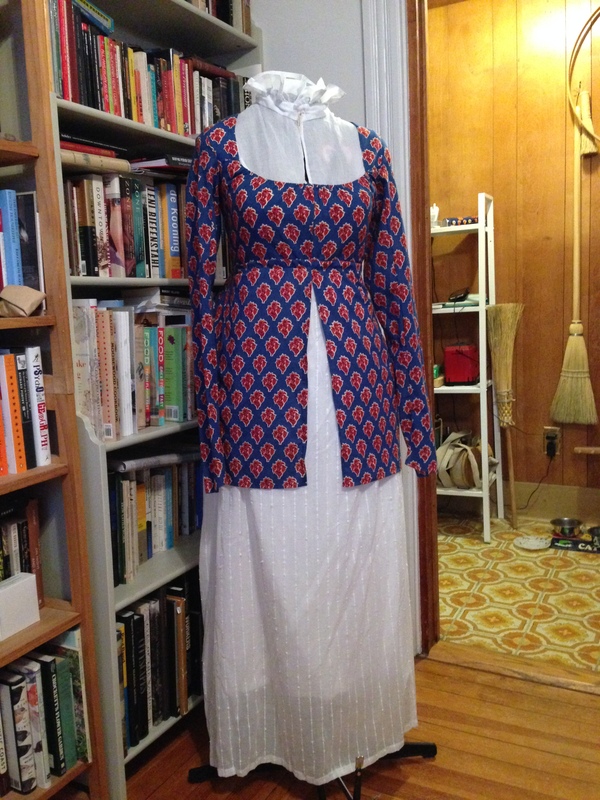 In the United States, “Regency Costuming” is a bit of misnomer if you’re copying early American gowns, but it does serve as a handy short-hand we all tend to understand. Grossly, the principles of dress are rooted in neo-classicism and republicanism rising from the American and French Revolutions. Specifically, we see a turning away from the heavily-boned, panniered, and formal gown styles to the looser, short-stayed, flowing, simpler gowns. The transition is summed up for me in this satirical print. So, you’re no longer side-to-side wide, baby: you gotta have back. How do you get back? There are a couple of perfectly authentic tricks that do not require you to stuff a cat into the back of your dress, though you can do that if you want. The combination I have found to work is two-part: a small, crescent-shaped pad, and the method of pleating. How you deploy the pad and the pleats will give you the silhouette you desire. First, though: which silhouette? 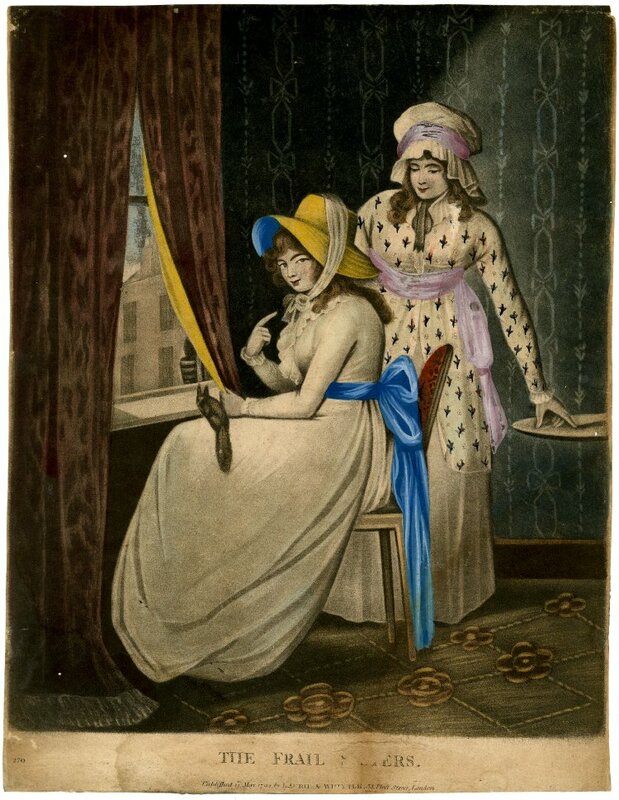 In really the 1790s, the silhouette is rounder than you might think. It really is a round gown. To get that look, I use a small rump pad, bustle pad, or bum roll (call it what you like), which is stitched to the inside of my petticoat. That’s the white IKEA curtain petticoat I made during the extended snow days of last year, and which I have worn with the red curtain-along open robe and under the petticoat and open robe for What Cheer Day. 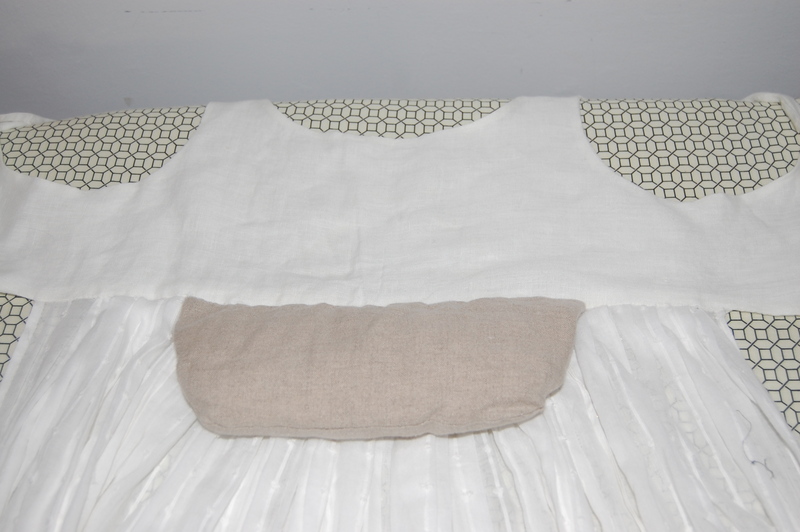 The pad is the same natural light-weight linen I use for a many gown linings, filled with bamboo stuffing. If I’d had wool on hand in the small hours of the morning I made this pad, I would have used it, but all I had was bamboo in the rush to finish up and have something to wear for a photo shoot. 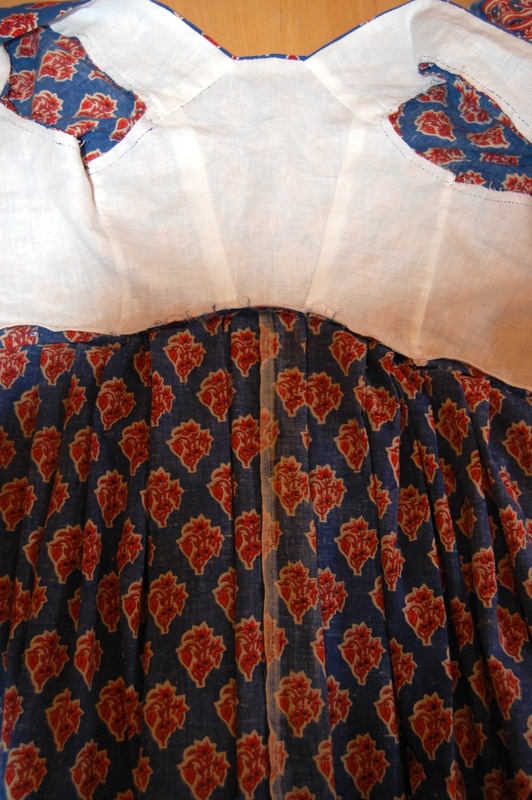 The other key factors are pleating styles and fabric weight. 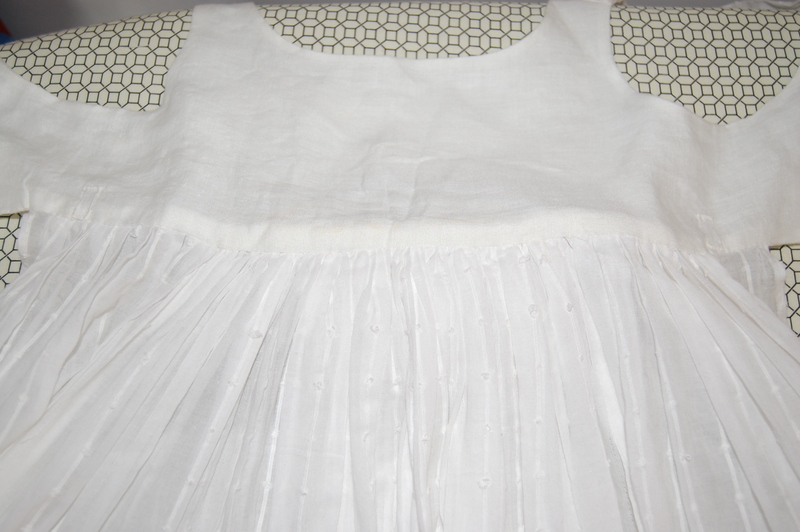 Pleats can add lift, but in general, the lighter the fabric, the more lift a small pad will give you. 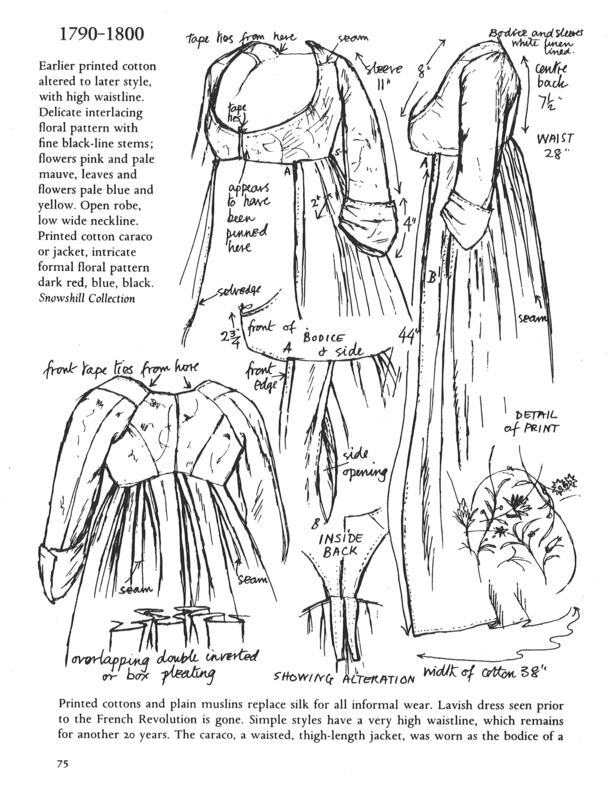 I’m particularly fond of the pleats used for the gown shown on page 75 of Nancy Bradfield’s Costume in Detail. I’ve used this as a guide several times, and I am very pleased with the results. They do vary, of course, depending on fabric weight, fibre, and length. 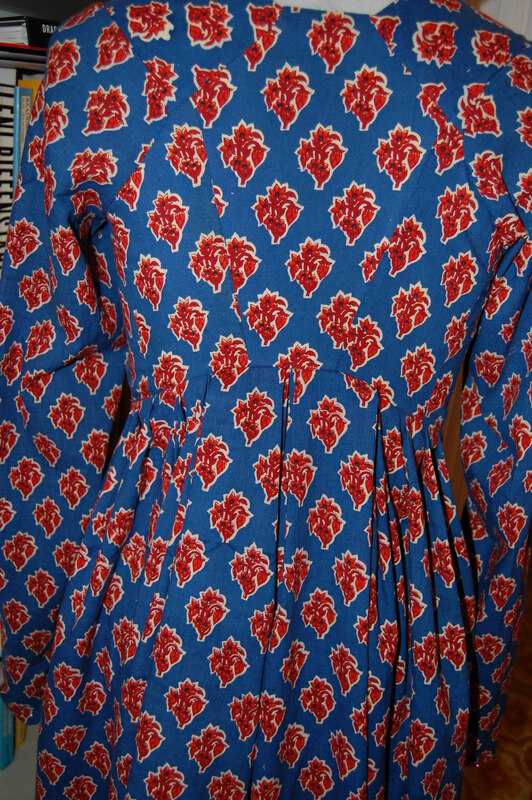 Stiffer cottons, like the Waverly Felicity of the curtain-along gown, will make a round shape; tropical weight wool does fairly well, also, but the most amazing 1790s rendition I have achieved to date is the light-weight India print cotton short gown. Now that’s 1790s back. 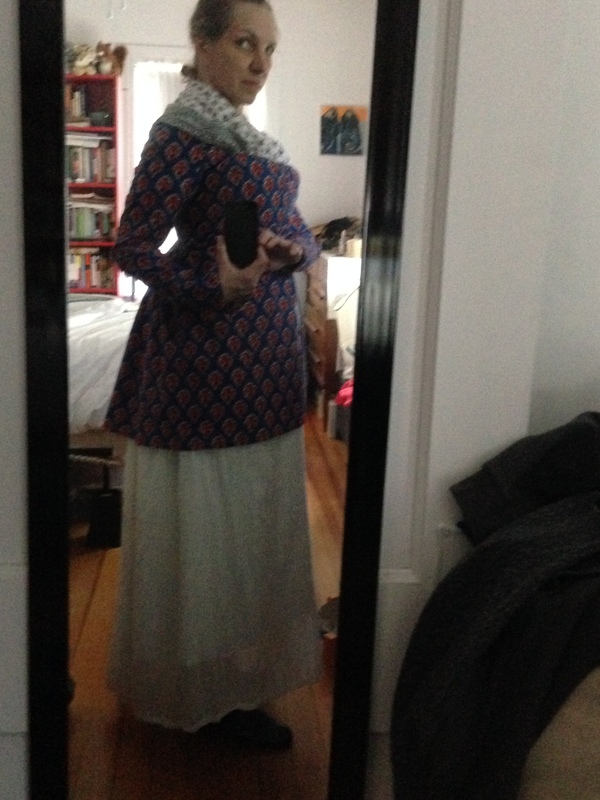 The bustle-like shape surprised (OK, shocked) me, but on the whole, I think I’m pleased. So there you are: pad, petticoat and pleats: that’s how you get back. It’s perfect! 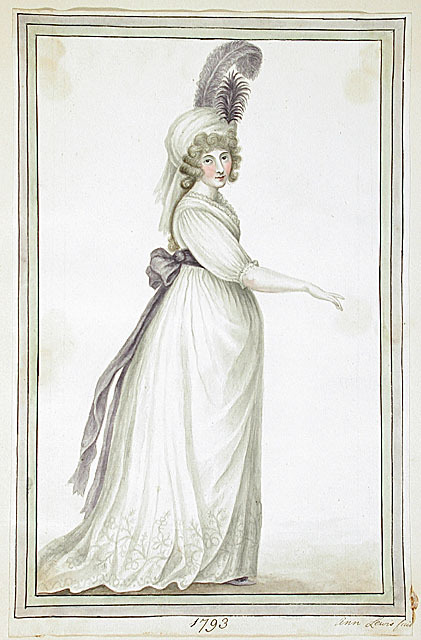 I love that look for the 1790’s.